Protection plans are traditional insurance plans which are usually low cost and benefit the family of the insured in case of death/permanent disability. Term/Protection plans are convenient, hassle-free insurance options. A policyholder can choose to pay a single premium or multiple premiums throughout the policy term. SBI Life Term Insurance/Protection Plans offer a wide variety of plan options such as Level Cover, Increasing or Decreasing Covers to suit the requirements of all kinds of policyholders. All policies afford a death benefit to the policyholder’s family. Thus, a policyholder can enjoy peace of mind knowing that his/her family will be financially secure even in their absence. Term Insurance/Protection Plans are low cost insurance. A small premium amount can often buy a huge protection coverage for the policyholder, depending on their age and health conditions. Term Insurance/Protection Plans are the best bet to ensure that one’s loved ones do not suffer in cases of unforeseen events. These plans often offer special benefits in cases of accidents. These plans also encourages policyholders to maintain a healthy lifestyle by offering rewards and incentives for doing so. 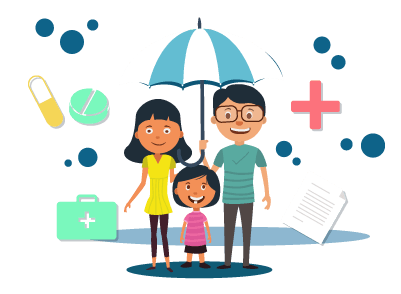 Term/Protection insurance allows policyholders to claim tax benefits under section 80C the Income Tax Act, 1961 on the premium paid for purchasing the insurance plan, provided the premium amount doesn’t exceed 10% of the Sum Assured. SBI Life Term Insurance/Protection Plans comes with riders for accidental death, accidental total and permanent disability and critical care. This is a participating term life plan that provides all around financial protection at affordable premium costs. It can be customized with riders for accidental death, critical care etc. The plan also awards you for maintaining a healthy lifestyle. This plan provides for financial security of a lifetime for the family and loved ones of the policyholder, all at very affordable costs. The plans also offers additional rewards to the policyholder for maintaining a healthy lifestyle. The plan comes with 2 options - Level Term Assurance and Increasing Term Assurance. Huge rebates on Sum Assured. Wide range of riders available on this insurance plan to ensure that the policyholder can get any kind of coverage required. Death Benefit: In the unfortunate event of demise of the policyholder while the policy is in force, their selected nominee will get death benefits. The Sum Assured will depend on the option selected. For Level Term Assurance: Sum Assured effective as on demise of the policyholder will be the Sum Assured level selected. For Increasing Term Assurance @ 5%: The Sum Assured effective on the day of demise will be the Sum Assured increased at the rate of 5% p.a. Maturity Benefit: This plan does not allow for any maturity benefit. Maximum: Depends on the Sum Assured being offered. Saral Shield, as the name suggests, makes getting an insurance easier with very low premiums and adequate coverage. This is a traditional term insurance plan that also doubles as a loan protection plan. There are also special discount on premium for women policyholders. Decreasing Term Assurance (Loan Protection). Decreasing Term Assurance (Family Income Protection). The plan offers additional discounts on the premium amount to women policyholders. Large rebates on Sum Assured. Two different riders available to increase the protection of the policyholder. Death Benefit: In the unfortunate event of demise of the policyholder while the policy is in force, their selected nominee will get death benefits. The amount of Sum Assured will depend on the option selected. Grameen Bima is a micro-insurance term plan that benefits the economically challenged sections of the society, especially in the rural areas of the country. The aim of this plan is to provide some life cover to those who need it the most at the lowest premiums possible. The premium amount actually depends on the life coverage required. The plan is available to individuals from the rural section of the population and only for a short term of 5 years. This plan allows the life assured to choose his/her premium amount. Their life cover is decided accordingly. The plan does not call for any medical examination, resulting in prompt policy processing. The policyholder has to provide only satisfactory declarations of sound health in the proposal form for acceptance. The registration form is quite simple, keeping in mind the target demographic, to facilitate easy enrolment. Death Benefit: In the unfortunate event of demise of the policyholder while the policy is in force, their selected nominee will get the Sum Assured. Surrender Benefit: This policy can be surrendered from second year onwards, at which event the policyholder is eligible to get a surrender benefit payable in the last year of the policy. The surrender value is: Single Premium x 50% x Remaining term on the policy in months/Total Term in completed months. There are no riders available on this insurance plan. eShield plan is a participating term plan that comes tailored with multiple coverage choices to suit the needs of different policyholders. This plan covers Accidental Death Benefit without any additional riders. This plan is accessible online. The application process is smooth and easy to ensure everyone has access to the plan. The premium amount is quite affordable and depends on the Sum Assured sought. Multiple plan options such as Level Cover and Increasing Cover available. In-built benefit for Accidental Death available with this plan. Death Benefit: For policies still in force, the nominee gets the effective sum assured in event of demise of the policyholder provided all premiums are paid The Sum Assured depends upon the option selected. Accidental Death Benefit: Comes inbuilt under the following plan options- Increasing Cover with Accidental Death Benefit and Level Cover with Accidental Death Benefit. In case of accidental death of the policyholder before the term of the policy ends, Accidental Death Benefit is paid to the beneficiary in addition to the Sum Assured. Accidental Death Benefit is as much as the Sum Assured (basic) or Rs.50 lakh whichever lower. Riders: There are no separate riders available with this plan. Maximum 65 years for Level cover, 60 years for Increasing cover. Why do you need SBI Life Term Insurance/Protection Plan? SBI Life Term Insurance/Protection plans provides the most important thing that one requires insurance for - protection. Protection plans ensure that a small amount of premium paid affords the family and loved ones of the policyholder with a better future prospects in case of an unfortunate event of a policyholder's demise. Term or protection plans are a safe bet where the policyholder can rest assured that their Sum Assured remains unaffected by the ups and downs of the market. Various riders and options available with these plans ensure that the policyholder is prepared for any situation. All term insurance plans are eligible for tax benefits on the premium paid under section 80C of the Income Tax Act, 1961. Since term insurance provides only death benefits, the payout that the nominee of a policyholder receives is fully exempt from tax deductions.